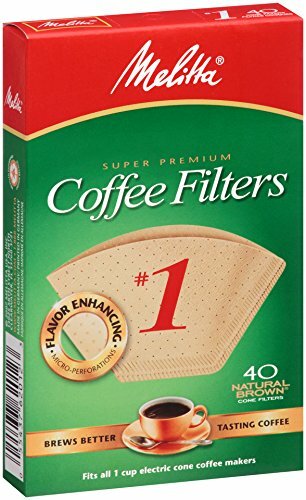 Thicker, textured, high quality paper with patented flavor enhancing micro perforations, traps harmful oils & bitter sediment to deliver the full taste and aroma of your coffee to your cup! An added extra crimp for additional strength, prevents filter bursts and provide safe, easy disposal. Made from unbleached paper pulp for today's demand for environmentally safe, natural products, Melitta makes annual contributions to the American Forests Global Releaf fund. Fits Melitta coffeemaker models ACM-1/1, ACM-2/1, ACM-1T/1, ACM-1TM/1, ACM-1A/1, and others that use a No. 1 size filter cone.